What Are the Odds of Twins Born in Different Years? The following is a guest post by Louise Firth Campbell and Amram Shapiro, the authors (with Rosalind Wright) of The Book of Odds: From Lightning Strikes to Love at First Sight, the Odds of Everyday Life . Rare news stories recur with surprising regularity — one of these annual stories is the birth of twins in two different years. You can see the appeal to editors. Babies are photogenic, especially twins. The symbolism of the New Year as a baby which ages to dotage by year end is an old one, a staple of thousands of New Year’s cards. There is an interesting apparent time tension in the story. Twins share a womb and genomes. Yet a few seconds separation in time of birth makes an apparent year’s worth of difference. This event is considered a rarity and only a handful of cases are reported in the press each year. This rarity makes it news, but is the event really as rare as it seems? Let’s start with the news in 2013/2014. If the cases reported in the North American media, two in the U.S. and one in Canada, are the only cases, these events are rare indeed. There are about 4 million births a year in the U.S. That would suggest these events are as rare as 1 in 2 million. Someone visiting the Grand Canyon is more likely to die by falling off the edge (1 in 1.5 million). That doesn’t feel right to us. It is plausible then that there are more cases than make the papers. But how can we demonstrate that? And how many more? We thought to put it to a test by doing a rough speculative and assumption-based estimate of the likelihood. We’ll be interested to see whether Freakonomics’ creative readership has suggestions for refining the estimate. This is a corrected chart. See the addendum at the end of the post for an explanation of the corrections. Book of Odds used a thread, or linked chain of independent probabilities, to get an estimate. Where there are hard numbers, we used those. Where there aren’t good data, we made as reasonable an assumption as we could. Let’s start with all U.S. live births since we assume that C-sections are more likely to be scheduled for a more convenient time than midnight, and emergency ones tend to have a short interval between first and second twin’s birth — this leaves almost 4 million in a year. An emergency C-section hitting just on New Year’s Eve might be overlooked by this assumption, but it will apply far more often than not. Of these, the odds are 1 in 30.1 the birth with be of twins, or about 131,000 births. We don’t know exactly how many of these are vaginal births, but the CDC tells us it is more than half. Using 51 percent we get to a rough estimate of 66,896 vaginal twin births. Obviously it could be higher than that, but we erred on the low side. We don’t often make predictions, but we think it is a safe bet that no matter how many cases there are next year the media will report on only a handful of cases of twins born a year apart. *CORRECTION: Thanks for the comment, Abe, and the same to the others who found our error. Actually there are two errors. First, having determined the number of intervals which span the year, we counted each in terms of its minutes not as a single instance, ending up with an overstatement of 17 times. If you take the final number of 67 and divide it by this overstatement you get an expected number of spanning twin births of 3.9 The second error was to apply the odds to the sum of December and January births. If only December births were used, 3.94 would be approximately halved to 2 , which is what is reported by the press. Only December’s possible intervals matter since the January ones are simply 17 – December minutes. There are 16 of these combinations which span the year from 1 minute in Dec + 16 minutes in January to 16 minutes in Dec + 1 minute in January. Out of the total December minutes, or 44,640, only 16 will span the year. This means the odds a 17 minute interval spans December and January are 16/44,640 or 1 in 2,790. Apply this to number of births in December alone, which is 5,590, and you get 2. Could it be that our expectation that there was understatement in the press blinded us to the errors we made? We think it is possible, since just like those we were implicitly critiquing, we were attracted to our narrative: the news that the news isn’t always news. As a management consultant, I encountered a witty play on this issue of time at the boundaries, this time the International Date Line. A scientist at Motorola stood on one side of the date line and filled out a patent filing. He then stepped back across, going into the day after, and filled out a memorandum of invention. This dance allowed him to brag that he filed a patent the day before he made the invention. What the Patent & Trademark Office made of this anomaly, I never learned. Books of Odds estimates based on data in MP Ghiglieri, TM Meyers, Over the Edge: Death in Grand Canyon, 1st ed., 13th rev., Flagstaff, AZ: Puma Press, 2006. There is one step I'm not following. How do you get from 11,000 births in December/January to 67 in that 17 minute period? If there are about 89,000 minutes over that 2 month period then there are over 5,000 17-minute periods over that time so the odds of the first baby being born in one particular one over that span should be 1 in 5,000, or 2-3 births. Where does 1 in 165 come from? Thanks for the comment, Abe, and the same to the others who found our error. Actually there are two errors. First, having determined the number of intervals which span the year we counted each in terms of its minutes not as a single instance, ending up with an overstatement of 17 times. If you take the final number of 67 and divide it by this overstatement you get an expected number of spanning twin births of 3.9 The second error was to apply the odds to the sum of December and January births. If only December births were used, 3.94 would be approximately halved to 2 , which is what is reported by the press. Could it be that our expectation that there was understatement in the press, blinded us to the errors we made? We think it is possible, since just like those we were implicitly critiquing, we were attracted to our narrative: the news that the news isn’t always news. "As a management consultant, I encountered a witty play on this issue of time at the boundaries, this time the International Date Line." The story was told to me by the Patent Attorney at Motorola. He said the fellow was on a boat at the time. Is it a corporate legend? I don't know. The story is so much fun, in that it speaks to the arbitrary nature of boundary lines and the anomalies they create that I have dutifully repeated it for years. I would, of course, love to see the patent filing. There is another factor. As a former "wire editor" responsible for sifting the world news for the inside pages of a daily paper, I can attest that the news media reject all sorts of interesting stories in favor of the mundane. So interesting stories like this (year-apart twins) do get under-reported because editors are conditioned to choose stories that sound like hard news: Bus crash kills 10 in Mexico; Arab boy killed in rock-throwing riot; Sri Lankan rebels advance. These will raise no eyebrows in the news meeting with the bosses. "News of the weird" that readers would probably love just makes the wire editor look like a newbie who just doesn't "get it." The novice editor soon gets on board, becomes jaded, takes the easy path, and the inside pages become what they are -- a wasteland of boring non-news. Advances in news delivery since then have fragmented news so much that interesting news like this does get delivered, but only to a very fragmented audience on the Interwebz. There are 60 mins x 24 hours x 62 days = 89280 mins in Dec and Jan.
On average a first twin born in 17 of those minutes will be a 'year spanner'. 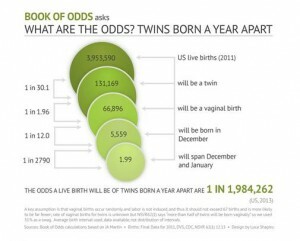 17/89820 chance of being a 'spanner' x 11000 twin births = 2 expected pairs of 'spanners'. Whoever did the stats here seems to have wrongly assumed the 11000 vaginal birth twins were all born on 31st Dec/1st Jan, not throughout the two months. As Abe Sutton, Ben, and Roj Miller have already pointed out in the comments, this is embarrassingly bad. Not only does the error involve rather simple math, but it completely undermines the argument, as having a couple of sets of twins born spanning the year boundary in the US each year (as the press reports) is actually what you would expect given the simplifying assumptions made. Whether the simplifying assumptions are correct, I do not know. For example, are those seeking to avoid the complications of dealing with two different birth years offset by those seeking fifteen minutes of fame? That said, once you make those simplifying assumptions, the mathematical error, leading to the wrong answer to the question about the press' behavior, is embarrassing. Only December’s possible intervals matter since the January ones are simply 17 - December minutes. There are 16 of these combinations which span the year from 1 minute in Dec + 16 minutes in January to 16 minutes in Dec + 1 minute in January. Out of the total December minutes, or 44,640, only 16 will span the year. This means the odds a 17 minute interval spans December and January are 16/44,640 or 1 in 2,790. Apply this to number of births in December alone, which is 5,590, and you get 2. Kudos for admitting that you made a mistake. Your correction, however, is still slightly off, though commenters Ben and Roj Miller are correct. You're using 16 in the numerator (16/44,640), whereas it should be 17. A first birth at 11:43pm on December 31 and a second birth at 12:00am on January 1 are in separate years. Thus, any first birth in the range [11:43pm, 11:59pm] results in the twins spanning the year boundary, yielding 17 possibilities, not 16. If you claim that 12:00am belongs to December 31 and not January 1 (which wouldn't make sense to me, but I would be happy to be shown that custom defines it as such), then the range for the first birth simply shifts to [11:44, 12:00], still yielding 17 possibilities. To understand this intuitively, imagine that the average time between births of twins was one minute. By your reasoning, there would be zero possibilities for the twins to span the year boundary, which is obviously false. Actually there is no 12:00 am, nor is there a 12:00 pm. There is, however, a 12:00 midnight and a 12:00 noon. Those two points in time occur once each in every 24 hours and are simply the dividing lines between pm and am and am and pm, respectively. Almost everyone knows the difference between noon and midnight. A year apart is not as odd as this: I know a set of twin boys that the OLDER twin had his Bar Mitzvah a MONTH AFTER his younger twin brother! You see, the Jewish calendar has every once in a while an extra month, called Adar I, to align it to the solar calendar. This set of twins was born at the close of the added month Adar I and at the start of regular Adar (or Adar II.) This meant that on a normal year, the older brother, who’s birthday was the 29th of Adar I, had his birthday on the 29th day of the regular Adar and his younger brother had it a month earlier on the 1st of Adar. Thus the older brother’s Bar Mitzvah was a month after the younger. I don’t know what the odds of this happening is but it must be slight. There is only a leap month every three or four years and the twins have to both be boys. They also must be born at twilight, since the Jewish day ends not at midnight but with the sun setting. This is not to mention that that Jews are a tiny percentage of the population. How many such other twins can there be? My brother and I are twins born in different decades. M e being 1939 and my twin brother Valentine 1940. What are the odds on that.